Thought I'd better post something before you all forgot me. 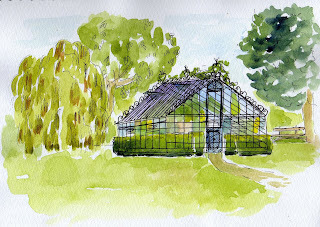 Here is my sketch of one of the lovely greenhouses in the Botanical Gardens in Buenos Aires. They have a distinctly Victorian flair from the time of British influence. The varied architecture is one of the interesting features of Buenos Aires. or sooner! As long as the sketchbook holds out I guess it's a kind of passport too. This vignette glows with color! Thank you! Don't you think an Urban Sketcher Spy Thriller would be a good movie? Not starring me though. We are home and getting acclimated. Seems kind of cold. Our daughter is coming home from London next weekend so I will miss the outing again. I am dismayed. See you in December for sure.